Observe the season of Lent, from Ash Wednesday to Easter Sunday, by giving up some of your stash and time to create a charitable knitting or crocheting project during this 40 day period. It's simple, beginning Ash Wednesday complete 30 minutes a day of charitable needlework a day. You pick the charity. Suggestions are given for your consideration. Then the Monday after Easter you're all done! Just think of all the good your kindness and contributions can make in such a short amount of time! Thank you to everyone who participated in my first Lint for Lent KAL. I hope to make this an annual tradition so please look here again in the weeks that precede Ash Wednesday. I hope this was a blessing for all who participated and for all who are fortunate enough to receive your work. I regret that I was not more active with the posts but the week prior to Easter my husband and I both got a nasty little virus that prevented me from feeling like posting. I am usually more involved with my group blogs than I was able to be this time. As for me I am nearly finished with the 2 prayer shawls I crocheted for my church. They only need a little more work. I hope to work on them some this weekend and maybe drop them off on Sunday or Wednesday. I ran out of yarn for one and didn't feel well enough to trek to the store for it. Please tell your friends to join us next year! On a happier note, I finished a scarf, a baby's shrug, and almost finished my first pair of socks knit in the round - I just have to use Kitchener stitch on the toes. Thanks for putting this KAL together, and thanks to everyone who participated. I already do most of my knitting for charity and have joined an Australian Yahoo group for further support and sharing: knit4charities. Come over and visit my blog anytime. God bless you all. 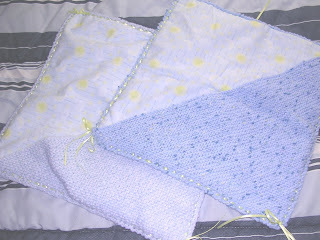 I finished the burial wraps that I was knitting for The Preemie Project. They were easy to make, and I hope that the families who need them will be comforted by them. These are used to swaddle the tiniest babies, as they are often too fragile to be dressed. The families can hold the baby and take photos if they wish. My next project will be some quilts. I have been inspired by Lint for Lent to continue in this commitment after Easter. So often, I have the intention to make or finish a project for charity, but get side-tracked with all of my other commitments. Setting aside 30 mins a day is easy to do, and even though it seems that I don't get much done in 30 mins, all those rows add up! Thank you to all of you who have inspired me with your good works! I wish you and your families a joyous Easter! Well, it's now Passion Week and my prayer shawl still looks like it's for a little girl. I'm not sure if it just looks that way on the needles or if it really is. I've done a gazillion stitches and it looks really nice, it's just looking small. It's gone really slow because you only do one yarn over per row. I probably have 500 stitches right now on the needle. I'm determined to get this done by Easter, so I better stop typing and start knitting. Well, it's not really finished. I completed the knitting three days ago, but I still have to sew most of those 112 squares together and darn in the ends, then it will be truly finished. I will post a photo when I have completed the project (goal date 31 March). Over the last couple of days I have knitted three squares (10 x 10 inches) for another afghan and made some sample swatches for a lace wrap. This morning I was awake really early so I got up while it was still dark. I couldn't face sewing squares or knitting squares, so I started a baby shrug to give to the local Tresillian. Blow me down, it will take longer to knit than a square for the afghan. The body is 80 stitches per row for 200 rows and the cuffs are 40 stitches per row for 16 rows each. It doesn't sound like much but using baby yarn on 3.25mm (US 3) needles, it doesn't grow very much. Ah well, we live and learn and hopefully many babies will be warmed by the finished project. I finished this a couple of days ago. It is my second one. I had extra strawberry buttons so I couldnt resist. It is the Mary had a little lamb sweater. It is really quick. I did it in three nights. I love this KAL. Thanks for doing this. That hat I just made up so it looks a little weird but I think it works. Here is the prayer shawl I've been working on. I am putting the finishing touches on it now. It seemed a little narrow so I'm adding a ruffle trim all the way around to make it larger. I hope the ruffle will also make it look larger even if the overall effect doesn't add that much width to the garment. I'm planning on making another pass at the edges to make the ruffle even larger. The color is a little hard to define but the name of it is "Flamingo" and it does look like the color of real ones, not the bright pink plastic ones we typically see in Aunt Marge's yard. I have already started another one. I needed to sample some yarn that I've been winding for the church to make sure that it was knit/crochet worthy so I began another just to give it a test run. I like it even more than this one. I have been working away on my burial wraps for The Preemie Project. A lot of people think this is depressing, and alot of TPP knitters don't knit bereavement items because it is too difficult. But I think of it as a hug for the parents. I hope they are comforted by the thought that someone understood that this would be a difficult time for them, and has prepared for it. This yarn is really cute, but it is a real pain to work with because it splits a lot! The little nubs of dark blue and white give it an interesting texture. The garter stitch feels very soft and squishy. I bought two skeins of it at a yarn shop in Jacksonville while I was on vacation last week. I am designing a shawl from these hexagons. I'm not even sure what shape the shawl will be yet, but I am having fun playing as I go. The yarn is random mohair from my stash. Anyone else have pictures? I'm a late joiner and this is my first time posting, but I wanted to say hello! I'm involved in several KALs besides L for L but this one definitely has the most heart. Which is to be expected, as it's put on by the fabulous Miz Knotty, who is nothin' but heart, baby! Due to the lateness of my arrival, I got right on the charitable knitting last Thursday night and worked my way through a chemo cap in about a day and a half. Then promptly gave it to my LYS (who collects the caps for the local hospital) without taking any pictures. Whoops! I used Patons Canadiana in "Light Juniper" and I must admit, the yarn wasn't what I hoped. I'm not a fan of acrylic, but I'm no acrylic snob, either, and I'll happily use it when the occasion demands it. And the Patons seemed promising. Besides being a pretty, Springy color, the Patons felt soft. It was not soft. It felt stiffer when knit then it did in the hank and I can't tell you why. It's still wearable, but overall, I'm finding a different yarn today to start a second hat. There's my greeting to the KAL. L for L: good! Patons Canadiana: not so good! I'm still working on the prayer shawl for my church, about 50% complete. Last evening I attended a meeting for the prayer shawl ministry and ended up bringing home about 40,000 yards of yarn to wind. No, that isn't a typo. Several people, present company included have acquired large cones of yarn from a factory here. The cones aren't practical to knit from and there aren't enough cones to go around. So since I own a winder I offered to wind them as part of my service to the church. It isn't all that difficult and I can do it at my leisure. My girl keeps call the giant cones "pretty circles" and that they are. A little update on my progress.. I have knitted at least a half hour everyday except for Sat which I had to go out. I have completed 12 hats (preemie) and I am half done on two blankets. I also knit teddies for Operation Christmas Child, a ministry of Samaritans' Purse. Please visit my blog to see more of what I've been doing knit-wise. Hi, I'm Emmy I found this KAL totally by chance when considering giving up knitting for Lent. After joining, I chose Prayer Shawl Miniseries for the group I will donate to. I'm sorry to say that I have only been able to work for about 15 minuets a day instead of a full half hour wail trying to work on my clinical studies at a nursing home, but half is better than nothing at all. I hope God understands. I'll try to get a picture of my progress here soon. But, if you could, please say a prayer for Iowa. We're in a disastrous blizzard and at least seven lives have been lost at last count. Over 1500 people are without power from the first storm and just today, a second one had hit. I just want everyone to stay safe. These socks now only need the toe grafted and they'll be off to Afghanistan. Thirty minutes a day adds up! I will start a prayer shawl next for a dear friend who is going through some serious crisis. I'd love to see pictures of what you all are working on right now. I joined the KAL on Ash Wednesday, and have been knitting daily for charity. I have three projects I am working on: a mint green baby sweater, hats for homeless teens at a group home in Atlantic City, and a burial wrap for The Preemie Project. There are pictures on my blog. I am also quilting for charity, and have the fabric washed and pressed. We are leaving for a vacation, and when I get home, I will be cutting out and sewing up the quilts. They are for a charity in Wildwood, NJ that provides a 2 week vacation at the beach for diadvantaged children. They have a huge beach house with 60 beds, and are desperately in need of quilts to replace the more worn quilts on some of the beds. My first project is a prayer shawl for my church's ministry. I'm using some rayon chenille that I got in large cones for $2 a pound. It's a lovely soft pink and will make someone very happy, I hope. It took me a while to settle on the pattern but I chose a crochet one from the Prayer Shawl book that Lion Brand has out ans is available from our church library. It is turning out rather well. I will post a picture in a few days. I haven't decided what I will do next. I was chatting with a lady at Barnes and Noble today who said that she knits for the local hospitals maternity wards. She makes buntings and matching hats for newborns who've passed away. What a wonderful thing to do to help ease the grief of a mother. You just never know all the ways that someone shares their talents to bless others. You can find more information about Afghans for Afghans here: www.afghansforafghans.org (I'm not sure if this will show as a link. I don't know how to put a link in a post.) But here's the url anyway. Hello, I am Lisa. I am trying to use up my stash. During this process, I have discovered charity knitting. I am really enjoying it and this Lint for Lent was just the thing to keep me going. Right now I am knitting a pair of socks for Afghans for Afghans to distribute to school kids in Afghanistan. I am surprised at the progress I can make in 30 minutes per day! I'm not sure what I'll do next....I'll share pictures when the socks are complete. Hello there. My name is Casey and I live in MN. And I am so excited to join this KAL. 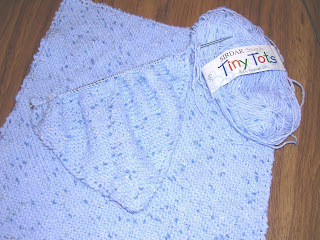 I am working on Lapghans for Our local chemo site and blankets for Linus. 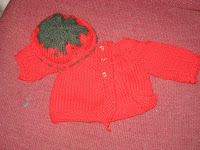 I also knit hats and booties for charity through Knitting 4 children group on Yahoo. I started today and knit for an hour. I am so glad I have the half hour rule. Tomorrow is the big day to begin our KAL! I'm really excited to have all of you join us. Please encourage anyone else you know to come along too. What are you going to start with? The object here is to knit or crochet for the charity of your choice during the season of Lent. The Lint for Lent (LFL) Knit-A-Long (KAL) will begin at sunrise the morning of Ash Wednesday, February 21, 2007 (or from the moment you found this and want to join in) and run through the sundown on Easter Sunday, April 9, 2007. For 30 minutes each day you will create an item for charitable giving. This can be a 7x9 square for Warm Up America, Caps to the Capital, a prayer shawl, a chemo hat, baby hats for your local hospital, you name it. If you want to send me links to free patterns that support this KAL I will gladly post them on the sidebar for all to see. Please show us your creations from the heart for others to see, admire and be inspired by. Email me at Ms.Knotty@gmail.com to join! Grab This Button for Your Blog! Add this image and a link using the button above!